I did this fun 'Animal Allsorts' card range at work. 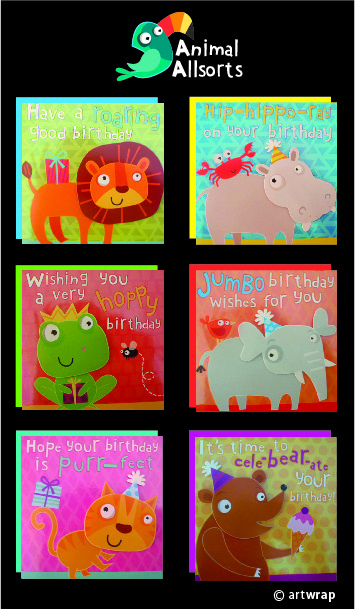 The 6 brightly coloured cards featuring tip-on faces, an overlay of clear holographic foil on the background and brightly coloured envelopes. These characters have also been extended into a wrapping paper, stickers, gift bag and a kids partyware range. Super FUN stuff!!! These are so cute and fun! A wonderful set of cards. Your art is very fun and imaginative. I love the bright colors and the cute colors. I love the bright colours and the big expressive eyes. So much fun stuff. And congratulations on your engagement and impending baby. Wonderful news!